Our 2016 Conference gathered 320 people from 9 states, 30 campuses, 35 nonprofits, 35 businesses, 60 Massachusetts communities, and more. Northampton and Amherst were good locations. The opening with three city officials from different municipalities was informative. I really enjoyed seeing and hearing what other communities are doing. There were a number of impressive presenters. It was nice to have a chance to hear and ask questions. Good mix of speakers. Manageable size. Local. Good lunch. Great speakers. Great networking. Well organized. 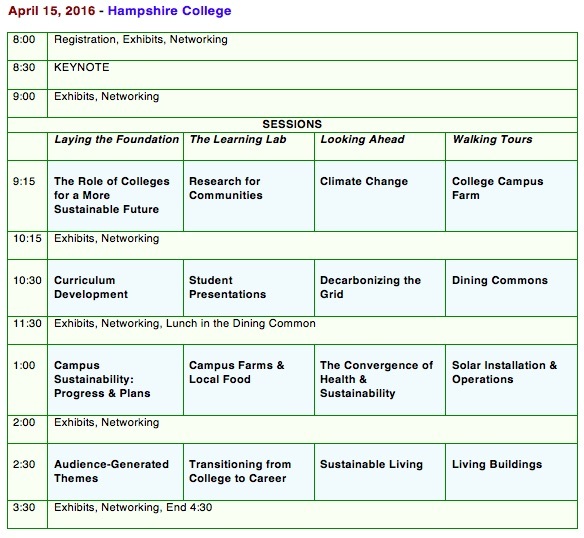 Hampshire College is the epitome of a sustainable campus. I enjoyed the community spirit of attendees and exhibitors who were able to have difficult conversations respectfully and productively. It’s wonderful to hear about the good work of so many dedicated people. Now I’m looking more at how to transition to a fossil-free economy. The solar presentations inspired me to work harder at helping with community-supported solar. Thank you for this great networking opportunity, lunch, and bringing forward-thinking people together. It was great to hear the speakers and meet people making a difference. The $0-$75 registration fee covers keynote presentation, breakout sessions, exhibitors, snacks, lunch, and networking. The Complete CAMPUS Program Click on presenter’s name to view PowerPoint presentation. The 21st century college campus has become an incubator for opportunity and innovation that can advance the sustainability agenda. Colleges today are empowered to confront energy and environmental challenges and to advance social, economic, and environmental agendas. Research and advocacy bring attention to important community concerns and engage students in the process. In 2015 it was not just world leaders who gathered for the Paris Climate Conference. Three New Englanders were among the concerned citizens who attended. They speak here about their experience and share thoughts on the event’s future impact. Take advantage of this unique opportunity to tour a 100+ acre working farm on campus which produces vegetables, meat, eggs, honey and maple syrup, and has a Community Supported Agriculture (CSA) program, sustainable growing practices, and a 100% local food challenge. Education is no longer confined to classroom basics. 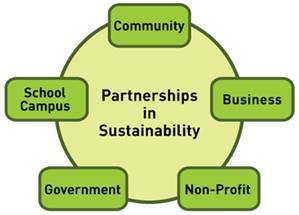 Sustainability programs and campus practices that engage students may be the best source of learning. Students and recent graduates describe exceptional projects on campuses and in communities. Reduction of fossil fuels is key to climate stabilization. Hear updates on the Massachusetts Clean Energy and Climate Plan for 2020 and Mass DOER clean energy strategy. Learn about large-scale, local, energy generation and storage projects that are complete or in the works. Guided by the motto “food service for a sustainable future,” meals on this campus are made from scratch using seasonal and sustainable ingredients. Tour highlights include the local ‘Farm 2 Fork’ program and other sustainable practices. Substantial changes are being made on college campuses where sustainability efforts are adding up. Hear from two colleges and a university making headway. Campuses teach students about food systems and engage them in sustainable living practices. Hear about the experiences of three institutions that engage in farming education. The health of each individual is irreversibly tied to the health of the environment and thus the planet. Learn about Hampshire College’s 19-acre, 4-MW solar installation planned for construction this year. This ground breaking venture will put them on a path to be the first residential college with 100% on-site renewable electricity supply. Let your voice be heard; share your thoughts. Participants talk together and process ideas at the end of the day. Navigating the journey from education to a meaningful career requires real world experience and opportunities. Career development experts share insights in this session. A sustainable lifestyle is made up of many components. We take a look at local food, tiny houses, biking, clean energy, social well-being, and living with less money. Opening on April 29, 2016, the R. W. Kern Center at Hampshire College is an innovative 17,000-square-foot ‘living building’, designed to operate completely off-the-grid by providing its own energy and water and treating its own waste. It aims to be the sixth building in the world to achieve Living Building Certification (LBC), which requires the creation of a net-zero energy, waste, and water building. Make use of this unique opportunity to tour the building. The Walking Tours were coordinated by Jess Marsh Wisseman, Food, Farm, and Sustainability Coordinator at Hampshire College. What is a STAR community? Why is Northampton, MA the top STAR community in the country? Find out what it takes to meet comprehensive criteria for sustainable development. City leaders from the agricultural town of Conway in Western Mass, and North Adams, the smallest city in Massachusetts speak about sustainability in their communities. Municipal administration, community, and sustainability are merging in Northampton and Conway. Sit in on a review of master planning and sustainability policies. Three American participants who attended the UN Climate Change Conference in Paris in 2015, share their impressions and insights. The Massachusetts Food System Collaborative envisions a robust food system and is working to implement the state’s first comprehensive food system plan since 1974. Right to Know GMOs is declaring our fundamental right to know if our food contains ingredients derived from Genetically Modified Organisms (GMOs). Extraordinary efforts burgeoning at the grassroots level across Massachusetts are aimed at tackling issues such as natural gas leaks in communities, banning plastics and divestment from fossil fuels. Hear from some of the leaders. Northampton, Massachusetts claims to be one of the most vibrant downtown centers in New England and boasts a large number of independently-owned businesses and socially-responsible ventures. Enjoy a guided tour to learn about sustainability in Northampton. City leaders from Greenfield, Leverett and Holyoke speak about sustainability in their communities. Caring for nature is essential for ecological health. Meet three institutions with different agendas and approaches to safeguarding the environment and our well-being. ‘Fossil fuels’ has become a dirty word. It keeps coming up in conversations, but what are we actually doing to enable and speed up the transition from fossil fuels to renewables? Grassroots movements affect change at local, state and federal levels and they are finally getting the recognition they deserve. This session gathers leaders, acknowledges accomplishments and broaches ideas for broader collaboration. Join this walking tour of downtown Northampton to see why it is ranked a STAR community. New England has many examples of highly successful academic and community partnerships. 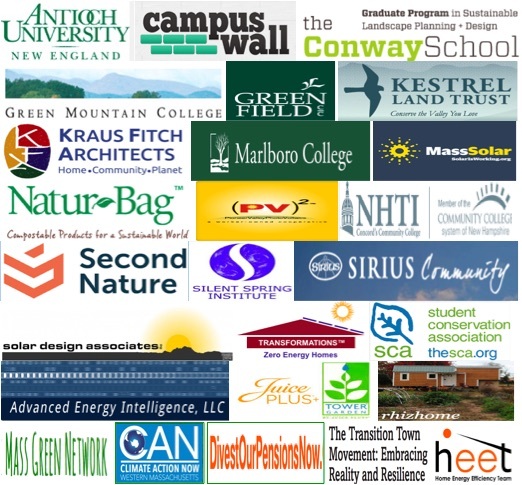 Greenfield, MA and Antioch University New England are leading the fray in many initiatives. Hear from those at the forefront of collaborative ventures. New and renovated buildings offer opportunities for more sustainable practices. Meet a recent college graduate who built a tiny home with local materials. Meet the company that collects data to estimate annual home energy costs. Meet a builder of net zero energy neighborhoods. Not a fashionable topic in the past, waste reduction is today an environmentally preferred practice that is getting the attention and respect it merits. Enterprising New England companies offer local solutions. One firm helps communities considering trail development; the other provides mentorship and accelerator programs for startups. What’s the point of merely talking about sustainability? 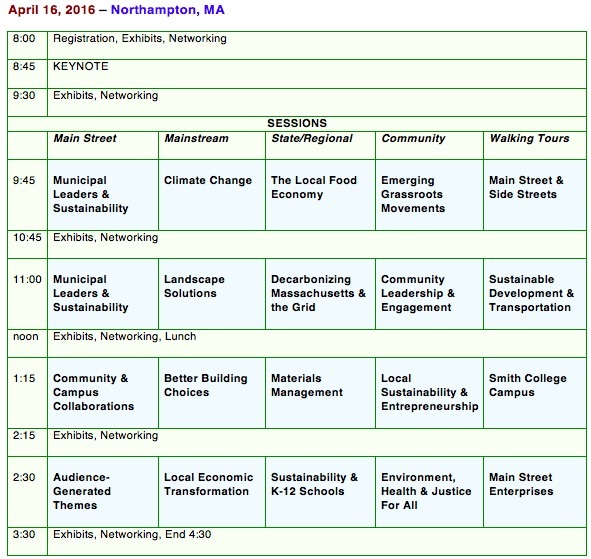 Get on your feet and walk across the street to Smith College to see real life sustainability practices on campus. Round off the day with communal sharing. Participants get the opportunity to talk through and process ideas generated during the conference. Cultural and environmental solutions pay dividends in communities that recognize and encourage the diversity of their citizens. Schools are often the largest budget item in towns and cities. Education programs and facilities management can make a substantial impact in creating the next generation of citizens who will be guardians of the planet. A healthy environment should be a right for all; it begins with education and green jobs that lead the way to a better quality of life. There’s nothing like a walkabout to experience the pulse of a town. See for yourself what makes enterprises thrive on Main Street.